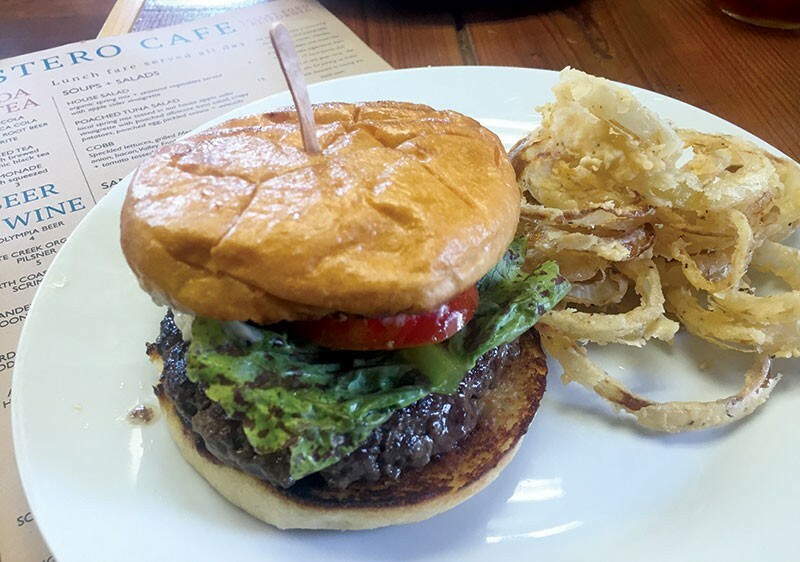 BUILDING A BETTER BURGER A roadside cafe has to get its burger right, and Estero Cafe hits the mark. Check out those onion rings, too. Estero Cafe is everything you want in a roadside diner, and a lot you wouldn't expect. Walk in and there's a long lunch counter topped with baked goods and jars of homemade blackberry preserves and hot sauce. There are half a dozen or so tables, and some classic rock playing in the background. Valley Ford locals Ryan and Samantha Ramey bought the restaurant in December 2014. The menu reads like classic diner fare—chicken fried steak, buttermilk waffles, tuna melts and cheeseburgers. But the restaurant stands out for it superior, locally sourced ingredients. The cafe could probably serve the typical Yuban coffee, Foster Farm eggs and Sysco truck canned goods you find at most diners. There are not many choices around Valley Ford, and hungry travelers and locals alike would probably take what they could get. But then again, the cafe is smack dab in the middle of the land of milk and honey, and many of those same tourists and locals visit and live here in part because they appreciate good food from good sources. So why not give the people what they want? Estero Cafe does. The menu includes ingredients from more than a dozen local farms and bakeries. The eggs come from Coastal Hill Farm in Valley Ford. Coffee comes from Taylor Made. The grass-fed beef is raised by Valley Ford's Twisted Horn Ranch three miles away. (The restaurant buys a whole cow at a time.) Sonoma County Meat Co. makes the bacon and sausage. The ice cream comes from Straus Family Creamery. You get the idea. Local and fresh. "We don't even have a can opener in the whole restaurant," says Samantha Ramey. There's also a small wine and beer list that includes Third Street Aleworks, Applegarden Farm hard cider and SCV Sauvignon Blanc. True, there are no $1.99 Grand Slam breakfasts. But good food costs more than crappy food. The one-third-pound barbecue bacon cheeseburger ($16) is good food. It comes on a Village Bakery bun with a choice of fries or onion rings. The fries are cooked in locally sourced lard, as are the feathery, house-made onion rings. Both are great. And you have to love the choice of cheese upgrades: Pug's Leap chèvre, Valley Ford blue and Estero Gold Asiago. Take that, Kraft. I loved the tuna melt ($12). Since Estero doesn't have a can opener, the kitchen poaches fresh albacore tuna and mixes it with celery, onions, thyme, green onions and parsley. Melted Swiss cheese on top and toasted sourdough bread finish the job. For a lazy-day breakfast, go for the hearty huevos rancheros ($13) served on a pepper jack cheese quesadilla and saucy heirloom beans. I also liked the biscuits and gravy ($12), a house-made fluffy biscuit topped with ham-flecked gravy and eggs on the side. Estero Cafe is open for breakfast and lunch daily from 7am to 3pm, and Wednesday the cafe does a fried buttermilk chicken dinner from 5pm to 8pm. (Why Wednesdays? Nearby Dinucci's and Rocker Oysterfeller's are closed Wednesday nights, and Valley Ford is a small town so it makes sense to coordinate.) The whole menu is available, but the star is the fried chicken. Estero Cafe, 14450 Hwy. 1, Valley Ford. 707.876.3333.